"You Need a Big Oven, That's What You Need!" Screamed a hijabi'd young woman at pro-Israel demonstrators in Fort Lauderdale, Florida yesterday. That comes at about 3:20 in the video below. Lots more rabid hateful slogans too. "You need a big oven" takes the cake though. Wow. This video has to be seen to be believed. So disturbing. This is in Fort Lauderdale?? "Is there anybody in his right mind who thinks that the United States should keep its doors open to Hamas supporters of the kind depicted in this video?" When I watched that video, I immediately thought: We need to restrict immigration. Again, afraid to say that out loud a few days ago. Why should we allow people in our country who do not share our values, who want to the destruction of our allies, who wish to see our country weakened, who reject our government and our culture? Local news station NECN relies heavily on ABC News for their international news coverage, and they're using ABC News for covering the Israeli defensive attacks against Hamas in Gaza Strip. Talk about skewed news! This morning, ABC News reporter Simon McGregor covered the attacks on Gaza Strip with repeated videos of injured and dead children. Yes, there are children being killed by Israel's defensive attacks against Hamas. Too bad Hamas launches its rocket attacks against Israeli civilians from apartment buildings and from people's homes, thereby inviting the death of its own innocent civilians. Hamas has been denounced by Muslims around the world for the tremendous violence and suffering it has brought to its own people, most recently by the London daily Al-Sharq Al-Awsat. What was shocking in the ABC/NECN coverage this morning was that ABC News used a clip from Palestinian TV of a seven year old girl who lost her family in yesterday's bombing. (The source of video is Palestinian Media Watch) ABC/NECN played the part where the devastated young girl says "I woke up and my four year old sister next to me was dead." ABC/NECN left out the part what the girl also says: "I say, Hamas is the cause in the first place, of all the wars." Funny how they edited that video clip. "On 12/28/08 Israeli Air Force attacks in the Gaza Strip killed at least 225 and injured hundreds more. These attacks come on top of Israelʼs siege on the Gaza Strip, a siege that has created a humanitarian catastrophe in which the majority of Gaza's 1.5 million Palestinian residents have limited access to food, water, fuel, medicine, electricity, and other necessities of life. Israel carried out the attacks today with F16 fighter jets and missiles provided by U.S. taxpayers. From 2001-2006, the U.S. transferred to Israel more than $200 million of spare parts for its F16 fleet. In July 2008, the U.S. gave Israel 186 million gallons of aviation jet fuel. Last year, the United States signed a $1.3 billion contract with Raytheon to transfer to Israel thousands of TOW, Hellfire, and "bunker buster" missiles. In short, Israel's attacks today on the Gaza Strip could not happen without the active military and political support of the United States, funded by our tax dollars. We need to take action to protest this attack and demand an immediate cease-fire." More here at the MAS Boston wbsite. Why isn't MAS demanding an immediate stop of rocket attacks from the Gaza Strip into Israel? Why doesn't MAS director Bilal Kaleem plan some rallies criticizing Hamas for their attacks against Israel? Even the Egyptian Foreign Minister is criticizing Hamas! Most of the world gets it that Hamas has the murderous intent to wipe out Israel. Why is MAS siding with Hamas? Why was the MAS "horrified at the Mumbai attacks" but had not one word to say about Hamas rocket attacks that have rained down on Israel for years? There have been 3,000 rockets fired into Israel from the Gaza Strip this year alone. MAS has no comment on that. Please go and show your support for Israel tomorrow. Don't let the Hamas-supporting, Muslim Brotherhood-backed Boston Muslim American Society get all the press coverage. 1) Masad Yousef, the son of West Bank Hamas leader Sheikh Hassan Yousef , recently converted to Christianity. "The son of a Hamas MP who is also the most popular figure in that extremist Islamic organization, a young man who assisted his father for years in his political activities, has become a rank-and-file Christian. 'I'm now called Joseph,' he says at the outset." And what does Masad "Joseph" Yousef say about Israel? "Send regards to Israel, I miss it. I respect Israel and admire it as a country...You Jews should be aware: You will never, but never have peace with Hamas. Islam, as the ideology that guides them, will not allow them to achieve a peace agreement with the Jews. They believe that tradition says that the Prophet Mohammed fought against the Jews and that therefore they must continue to fight them to the death." ".... An entire society sanctifies death and the suicide terrorists. In Palestinian culture a suicide terrorist becomes a hero, a martyr. Sheikhs tell their students about the 'heroism of the shaheeds'." May God bless Joseph and keep him safe. He won't be going back to Israel anytime soon. No campfires, canoeing or crocheted pot holders for these girls. Unbelievably sad. These are young, beautiful girls, people made in God's image (as we all are), and they're being indoctrinated in hatred and violence. What else can the kids learn at a Hamas summer camp? Israel turns 60 today, I believe. Yom Huledet Sameach, Yisrael. "As Israel celebrates its 60th birthday, the world should recognize the enormous gifts the Jewish state has given the world. Israel has exported more lifesaving medical technology to the far-flung corners of the earth than any nation of comparable size. It has done more to protect the environment, to promote literature, music, the arts and sciences, to spread agricultural advances and to fight terrorism within the rule of law." "Despite being a tiny state, just smaller than the size of New Jersey, the Gross Domestic Product of Israel is greater than that of all of its Arab neighbors." "As Catholics, our relationship with the Jewish people could hardly be more complicated or more shameful. Antisemitism had flourished within and without the Church. Pogroms in Catholic Poland betrayed this hatred. The Dreyfus Affair in France was largely the work of reactionary Catholic monarchists. And, of course, the sad history of the Spanish Inquisition showed before the Holocaust the irrational extent to which hatred of Jews could lead a people and a nation in Catholic Spain." "The Second Vatican Council and Pope John Paul II changed all of that. The Council denounced the charge of deicide against the Jews and brought about a new appreciation for the Covenant with Israel and the Hebrew Scriptures." "...As Americans, we have a different reason to celebrate Israel. She is our best ally in the world. Part of this is strategic: ever since Harry S. Truman, over the vigorous objections of the State Department, recognized the State of Israel 11 minutes after David Ben-Gurion proclaimed the state's existence in 1948, Israel and America have been in a strategic partnership. In an often chaotic part of the world, we had an ally that was stable and secure." "But, there is a deeper reason than strategic necessity for the alliance. It has to do with shared values. Israel may have been born physically in what was once Palestine but it was born intellectually in the heart of the West. Its founders were European liberals and socialists, people familiar with the Enlightenment and its views on the proper role of government." Winters tells an amazing anecdote about Ben Gurion ordering the fledgling Israeli army to sink the Altalena, an order carried out by the young captain, Yitzhak Rabin. A list of local activities to celebrate this vibrant country can be found here. Light (if any) blogging for a few days, I'll be out of town. Enjoy the beautiful pictures of Jerusalem taken by Gateway Pundit here. Israel and Pope Benedict to Save Western Civilization? "Magdi Allam, 55, deputy chief editor of Italy’s most influential newspaper Il Corriere della Sera, is again at the center of the storm following his seventh book, dubbed Viva Israele (Long Live Israel). The subtitle of the book reads From the ideology of death to the civilization of life: my story. " "....According to Allam, Nasser is responsible for having turned Egypt - and the rest of the Arab world - into the cradle of the 'ideology of death'. Allam claims Nasser brought about an aggressive pan-Arabic dream based on the denial of Israel’s right to exist. The need for the destruction of Israel is the dominant theme that, Allam states, made death and destruction the core values of a once liberal Islamic culture. Thus, the new book defends the existence of Israel and terms armed Palestinian groups as 'dangerous terrorist threats'...."
"Allam says that 'Israel - along with Pope Benedict XVI - represents the residual hope for Western civilization, which, more than other civilizations, embodies the sacredness of life and personal freedom.' "
That sounds like a book I might like a lot. I hope there's an English edition. Allam was raised as a Muslim and was an enthusiastic supporter of the Palestinian cause. Years later, he met Yasser Arafat, and he concluded that Arafat was responsible for Palestinian terrorism and for the ideology of death which plagues them. According to the article, Magdi Allam is the "new Salman Rushdie" of Italy. Solomonia was present at last night's "forum" at the Andover High School about the Wheels of Justice stop at AHS earlier in the day. Sol has a fantastic write-up of the WOJ presentation and the reception by the Andover towns people. Fox News covered the event on last night's 10 o'clock news. The school lawyer came off as clueless, claiming this was a freedom of speech issue, the school couldn't NOT let the WOJ people speak. What nonsense. How about if some Andover teachers lobbied to have White Aryan nationalists or Aryan militia groups speak to their classes? That would not be entertained for two seconds. But for a group which supports suicide bombing and the destruction of Israel - not to mention its members who are dedicated to the overthrow of US-led global capitalist oppression - no problemo. "Caroline Glick is an eloquent and passionate analyst whose commentaries on the political and security situation in Israel have been widely published. A Chicago native, Ms. Glick is deputy anaging editor and senior columnist of the Jerusalem Post, and Senior Fellow for Middle Eastern Affairs with the Center for Security and Policy in Washington, D.C. From 2004 to 2006 she served as a civilian research fellow at the Israel Defense Force's Operational Theory Research Institute." "Ms. Glick was a captain in the Israel Defense Forces and a core member of Israel's negotiating team with the Palestinians from 1994 to 1996. She later served as assistant foreign policy advisor to then Prime Minister Binyamin Netanyahu. During Operation Iraqi Freedom, Ms. Glick was an embedded journalist with the U.S. Army's Third Infantry Division and was with the first unit to reach Baghdad. She has received numerous awards for her work." WHY? Israel invaded Gaza, the West Bank and Lebanon. The Israeli army is killing innocent women, men and children and destroying properties. This aggression must stop immediately. "This is a Hezbollah Internet video used for recruitment and fundraising right here in the United States. In one scene, Hezbollah fighters with bombs strapped to their chests line up at attention as the commander says, "We shall make the ground explode under the feet of our enemies, America and Israel." 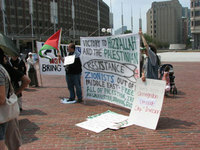 "
At the rally in Boston, there were many banners supporting Hezbollah. A local law student/activist Seva Brodsky was at the rally, where several rally participants tried to obstruct his filming of the rally, take away his camera, and insulted and verbally attack him. Welcome back, Seva! Plenty of work to be done here. Sol has an excellent write-up, Mayhem at the Defend Hizbollah Rally. He's posted Seva's videos from the event. Disturbing that this is going on in Boston. E-mail from Haifa, Israel / "Our Heads Are Up"
I heard from a dear friend in Haifa, Israel this morning. I've been worried, since Haifa has been getting shelled. 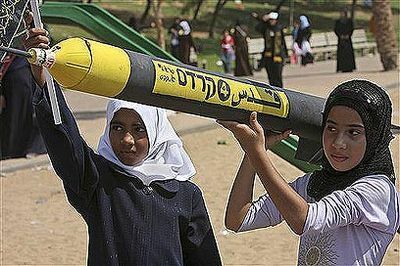 According to Startfor, "The missiles that landed in Haifa, Israel, fired from Lebanon were manufactured in Syria, and were anti-personnel weapons with warheads composed of an explosive core surrounded by ball bearings for maximum personnel damage..." Ironically, the two deaths in Haifa from yesterday's shelling were Israeli-Arab children. "We're fine, thanks. My daughter is in Tel Aviv, but plans to join the rest of us are in Haifa when she finishes her work week this evening. My husband got a call Saturday night that his workplace would be closed so that they could make some security preparations. Since then they decided to cancel work this week. I was at work when we heard the first explosions in Haifa on Sunday morning. I was in the bomb shelter for a couple hours, then got a ride home with a co-worker. The kids and I haven't been out of the apartment since Sunday. My husband goes to morning prayers, buys food, then comes home. We just now got woken by a siren this morning at 5:23 a.m. That was annoying." "It is also annoying to read a lot of the US media coverage. We are not panicking (my daughter was incensed at the notion) and when we have to take shelter in our little, relatively protected inner corner of the apartment we are not cowering. Our heads are up, metaphorically, if not always literally. We have a lot of patience. Hizbullah and Hamas have to be crushed if we are ever to have peace. It amazes me that people are so afraid to look at what connects those terrorists with 9/11; Bali; Madrid; London; the arrests of those people in Toronto who came from all walks of life and varied backgrounds as the papers were anxious to insist; and Mumbai, just to name a few recent headlines. It's like Voldemort. People think that by not mentioning the name they'll be safer. Oh well." "Regard all media reports with a great deal of skepticism. Too many reporters are stupid and lazy. For example, US TV news was reporting on the Haifa bombings while showing pictures in the background of attacks on Nahariya. I do much prefer that to them reporting live about what fell where when ("adjust your coordinates boys, you just barely missed a strategic target") and revealing troop movements on TV. Some of these guys don't understand that they, too, are targets." Given the nature of the Western media, and how exceedingly well Hamas/Hizbollah manaipulates the media, maybe the reporters aren't targets. Talk about a fifth column. Looking a lot like a war over in the Middle East. Pajamas Media is following the developments in real-time. My sense is that the Iran and Syria are behind the attacks on Israel. It's getting bigger and uglier with each passing hour. (Thanks for the tip from Solomonia.) Michael Ledeen has more thoughts on the rapidly escalating war here. And Yossi Klein Halevi has more to say here, including this: "The next Middle East war--Israel against genocidal Islamism--has begun." My thoughts and prayers are with the people of Israel, since their entire population is on the front lines, so to speak. And especially for my good friend Linda, who lives with her family in Haifa, which was hit by a Hizbullah missile (fired from Lebanon) today. TV and radio in the Boston area seemingly can't cover any other news except for the tragic death of a woman on the Ted Williams Tunnel earlier this week. As you probably know, a 38-year old mother of three was crushed to death when a 3-ton ceiling tile fell onto her car. This from the recently completed, grossly overbudget, $14 million Big Dig construction project. It's quite horrible. But I'm annoyed that there is almost no coverage (and zero analysis) of the coordinated bombings yesterday in Mumbai (Bombay), India, with its death toll of 200 and rising. Or coverage of the war underway in the Middle East. Hey Boston news media, there's a big ole world out there too.